Monitor and cap your Mac’s Internet data transfer on Wi-Fi networks or while tethering with a well-made management tool. TripMode 2 ($8) solves the macOS user’s dilemma when tethered to a mobile data connection or using a limited-data VPN or a conference center, hotel, or coffeeshop data-restricted pass: how to keep Internet bandwidth-hungry apps from eating your data allotment, leading you to run out of high-speed data for the month or having to purchase additional units. It also helps keep those apps at bay when you’re on a slow connection. TripMode lets you select which apps get to access the network and which don’t, and tracks usage. With TripMode installed, no app or background process can communicate with the Internet unless you flip a switch next to the app’s name. In this new version, you can create profiles, either automatically when you switch among Wi-Fi, Ethernet, and tethered connections, or manually, for particular purposes, like “at a coffeeshop” or “on cellular.” There’s also a master on/off switch in its menu, and TripMode remembers by network or connection type (like USB for tethering) if you turned it off entirely the last time that connection was used. Most software lacks any notion that it’s burning data. 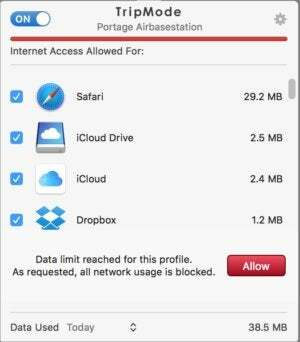 You can, for instance, pause Dropbox’s sync or restrict CrashPlan backups to specific Wi-Fi networks. But that requires a lot of configuration for each network you visit or a lot of clicking buttons whenever you change network methods. TripMode provides a one-stop location to manage that. You’ll be surprised how many harmless software agents (in Unix parlance, daemons!) want to reach out and touch some server. As your session continues, more and more background macOS processes and agents start to fill the list. You can opt which to allow, while the rest remain blocked. The dropdown system menubar item for the app shows data usage in real time for apps allowed to connect, as well as letting you sort the order in which apps appear. In this new version, you can sort in reverse order by most data used, alphabetically by name, using recency of activity, or a combination. Nice touches abound, including the option (set by default) to flash the menubar icon red whenever a blocked app or agent tries to access the Internet. This can be useful if you’re trying to make sure that everything you want to connect can. When you hit an optionally specified cap, TripMode stops Internet traffic passing. 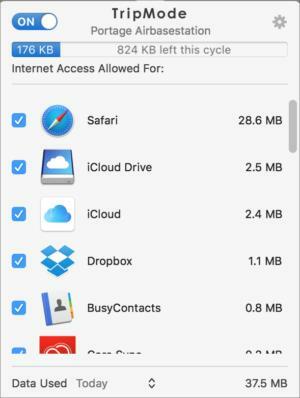 TripMode 2’s profiles let you choose to set a maximum amount of data that can be used before the app blocks all Internet access. And you can (also optionally) pick a period of time—daily, weekly, or monthly—after which that cap resets. You can always also click Reset Now. The app lets you pick a point before all data is used up at which you’re warned, too, so you have some advance notice. And even after you’ve exceeded your cap, you can tap an Allow button in the menu to continue using the Internet. Unfortunately, you can’t throttle by app, either by limiting its throughput (bits per second) or giving it a cap per session or month or so on. That could help tune performance better, if you want small amounts of data to pass from some agents, but not software updates or massive background downloads. When you exceed a specific cap, you can override with a click. TripMode tracks consumption across profiles, though it only displays that bit of data in its dropdown menu, and you can only get exact information when you hover over the usage bar and wait for it to expand slightly. The Data Used display at the bottom of its menu only shows data used in the current session (the period since the profile last changed), during the current day, and during the current month. It would be handy to have an option to show a continuously updated numeric display for the current profile there, too. Capping usage used to be a big financial issue, at least in the United States. Now, for most of us with major carriers, the game is to avoid hitting a limit beyond which we’re throttled to a very slow rate for the rest of our billing period. That’s still worth avoiding. But you can still encounter this while using pay-as-you-go or fixed-data-allotment plans near your home or while roaming outside a territory or country. And while you can find unlimited usage VPN plans, some offer passes that restrict total data transfers. You might also use TripMode when you’re on a slow network, and you don’t want all sorts of sync agents—Dropbox, Photos, Evernote, and the like—to move massive amounts of data while you’re trying to get other networked activities accomplished. One missing element in profiles is a list of apps you’ve allowed; it would be great to see the list and be able to modify it in the profile dialog box instead of relying on the TripMode menu. TripMode offers advanced settings to help with how local data is counted correctly. By default, it treats all data entering and leaving the computer, including to other local computers, against its data totals. Likewise, it doesn’t count network connections from your computer to your computer (called loopback traffic) often used to communicate among services. But you can modify this. If you’re unconcerned about counting local traffic—all data that doesn’t pass through the Internet gateway set on the local network—then you can check Treat Local as Loopback in the Advanced preferences. And you can block loopback traffic and add whitelisted exceptions if you’re concerned or have a particular reason for tracking that data usage. Finally, a checkbox lets you add a display of loopback traffic in smaller type below each app or agent’s larger type showing Internet data transfers. My main critique of the previous version was that users had to whitelist specific apps rather than an option to allow all access by default and choosing to blacklist apps and agents known to be chatty or unnecessary on the current network. However, I’ve come around on that point. Too many background daemons move massive amounts of data at unexpected times. As a side note, TripMode has an exhaustive set of documentation, but it’s only available by clicking the ? in the lower-right corner of its preferences dialog box. The company should also make this available as a PDF download for easier access and searching, given how poorly Apple’s help system works. At $8, TripMode 2 is an affordable way to manage usage, and the new version earns its keep, plus rewarding early adopters of version 1, who receive a free upgrade automatically through the built-in software update. TripMode has a seven-day unlimited-usage free trial, after which it works for 15 minutes a day. It’s compatible with Yosemite, El Capitan, and Sierra (10.10, 10.11, and 10.12). The first version of TripMode gave you insight into what was going on, but had a number of limitations. Nonetheless, the first version received 4.5 mice, because there was and remains nothing quite like it for the data-usage-conscious traveler. This revision improves on every aspect, and deserves a 5 mice rating.